The Millenium Digital XL or DXL for short camera is an 8K camera built by a consortium of Panavision, their subsidiary Light Iron, and RED Digital Cinema. They call it a revolution in optics, color and sensor quality. 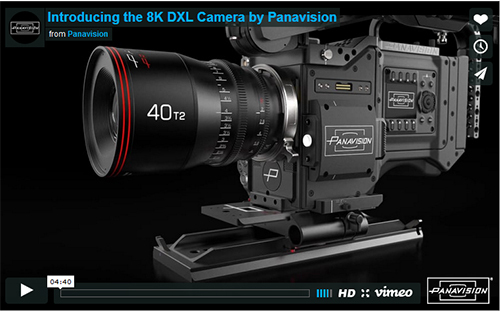 The DXL uses a large format 8K RED sensor, which has been optimized for Panavision’s large format lenses. The camera is clearly intended for the feature film business. It can capture both 8K RAW files and a 4K file in either ProRes or DNx, simultaneously. It outputs 21-megapixels of true 4K anamorphic images. The camera body incorporates an interchangeable power module, six independent video outputs, and dual side menus – one for camera operators and one for camera assistants. It also features built in WIFI. The DXL is kept cool longer by using larger fans than Panavision has typically used. The bottom of the camera includes a patented Steadicam Dovetail which enables switching to Steadicam in seconds. Through a combination of new Panavision T series lenses and the 8K RED sensor, DXL the 8K cinema camera provides the only 4K anamorphic motion picture images in the industry. The Panavision Primo 70 lens motors are activated internally by the camera. The DXL supports 6 independent 1D LUTs or several 3D LUTs. The large 8K format provides a much larger container and that enables more post production possibilities.